United Cutlery Black Legion Jungle Hunter Kukri Machete with Nylon Sheath(BV471) Machetes for every day use. Cold Stell machetes - high carbon steel survival machetes. Although it builds on an age-old, tried-and-true machete design, Black Legion's Jungle Hunter Kukri is more innovator than imitator. Based on the storied Nepalese “Gurkha,” the Jungle Hunter's distinctively curved kukri blade is legendarily versatile – as adept at chopping wood as it is clearing brush and slashing through tall weeds. The blade's unique weight-forward profile beefs up swinging momentum, yielding more bite from less physical energy, and, thus, boosting efficiency while reducing user fatigue. Wicked sawback serrations along the blade spine make quick work of especially demanding jobs like hewing dense hardwood branches or cleaving thick rope and other stubborn fibrous materials. 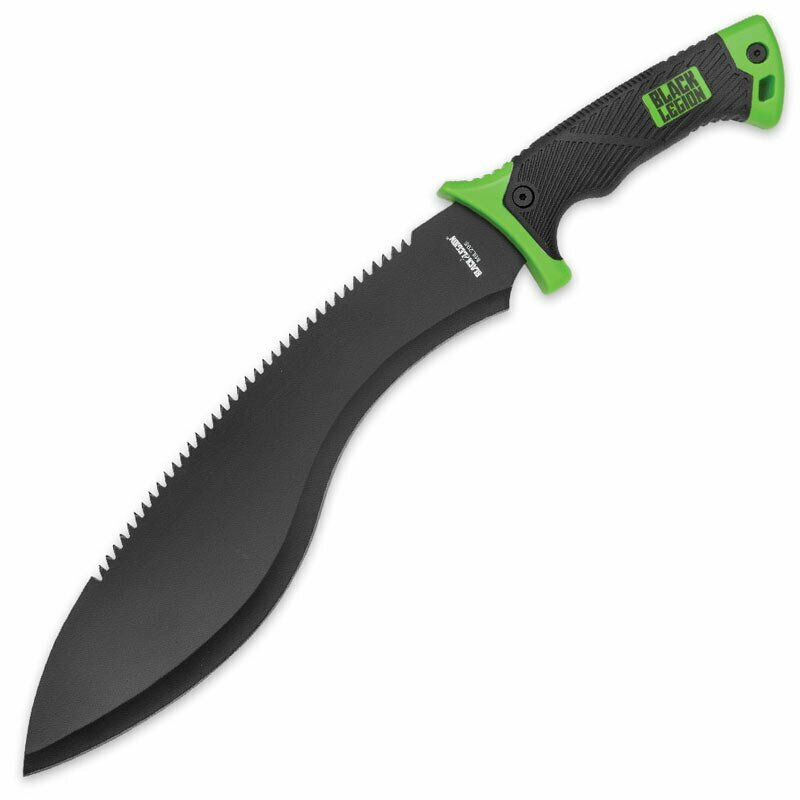 Engineered for harsh conditions and tough environments, the Jungle Hunter’s impeccable weight distribution and tough rubberized polymer handle provide maximum control and a superb feel.